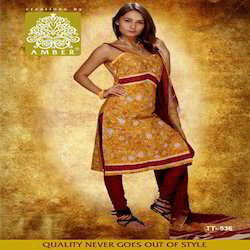 Please find attached along with the mail our new AMBER unstiched salwar suits sample photo For Summer 2010. 100% best quality Cotton Printed suits with mulmul duppatta . We offer a wide collection of Green & Red Designer Punjabi Suits that are crafted with elegant designs and offer an attractive appeal to the wearer. These suits are artistically designed by concentrating on the various desires and demands of the clients. This product is very much demanded during the Punjabi festive season. To furnish the increasing desires of our honored patrons, we are readily betrothed in presenting Traditional Printed Punjabi Suit with Dupatta. Our clients can avail from us an enticing range of designer salwar suit which is creatively designed by our experts. Our suits are known for features like color fastness, resistant to tear and perfect finish. Further, we also have the facility to provide these in customization to meet the specific requirements of our clients. We are manufacturers of computerised schiffli embroidery, computerised multi head embroidery, computerised punjabi suits and other fashion embroidery fabrics. We bring forth vast industrial experience and expertise in this business, involved in offering a high- quality range of Ladies Punjabi Suit.